The shell itself is highly specialized. Each egg shell has about 10,000 tiny holes or pores. How does that chicken form a shell around a soft, messy egg and design the shell to have porosity? Put a raw egg in warm water and soon you will see tiny bubbles floating up. These bubbles are escaping through the pores in the shell. The developing chick needs these pores to breathe. Evolution requires a need before an organism will change. How does a chicken know it needs to make a shell with porosity, and how can it manufacture such a shell? The chick does not know it needs the holes in the shell to breathe until it dies for lack of air. Of course, dead chicks cannot evolve. Within the first few days after the egg is laid, blood vessels begin to grow out of the developing chick. Two of these attach to the membrane under the eggshell and two attach to the yolk. By the fifth day, the tiny heart is pumping blood through the vessels. What makes those blood vessels grow out of the chick, and how do they know where to go and to what to attach? The chick feeds from the yolk with the yolk vessels and breathes through the membrane vessels. If any of these vessels do not grow out of the chick or attach to the correct place, the chick will die. The chick gives off carbon dioxide and water vapor as it metabolizes the yolk. If it does not get rid of the carbon dioxide and water vapor, it will die of gaseous poisoning or drown in its own waste water. These waste products are picked up by the blood vessels and leave through the pores in the eggshell. By the nineteenth day, the chick is too big to get enough oxygen through the pores in the shell. It must do something or die. How does it know what to do next? By this time, a small tooth called the "egg-tooth" has grown onto its beak. It uses this little tooth to peck a hole into the air sack at the flat end of the egg. When you peel a hard-boiled egg you notice the thin membrane under the shell and the flattened end of the egg. This flattened end, which looks like the hen did not quite fill up her egg shell, is the air sack. The air sack provides only six hours of air for the chick to breathe. Instead of relaxing and breathing deeply, with this new-found supply of air, the chick keeps pecking until it breaks a small hole through the shell to gain access to outside air in adequate amounts. 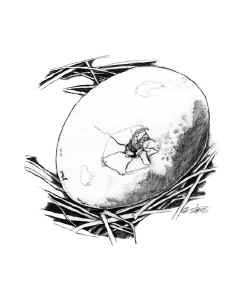 On the twenty-first day, the chick breaks out of the shell. If one step in the development of the chick is missing or out of order, the chick dies. Each step in the development of the chick defies evolutionary logic. The process must be orchestrated by God, our Creator. The impersonal plus time plus chance is not an adequate explanation for the incredible complexities of life as we observe it. God In Creation (Chicago: Moody Press, 1982), pp. 9-13. This booklet discusses ten of God's creations and shows how they could not have evolved. There are a series of these booklets.